join us in celebrating the millions of resilient syrian women and girls that are making an impact around the world. International Women’s Day is celebrated in many countries around the world on March 8. It is a time to reflect on progress made, to call for change and to celebrate acts of courage and determination by ordinary women who have played an extraordinary role in the history of their countries and communities. Kick off Women's Month with us in San Francisco! join us on friday March 16 for an intimate chat with comedian, talk show host, and activist, chelsea handler! Karam Foundation and WeWork San Francisco are inviting you to join us after work for drinks, small plates, and an intimate chat with Chelsea Handler on today's trending issues, what's important now, and her passion for helping Syrian refugees. Don’t miss this once-in-a-lifetime opportunity to see the trailblazing activist live! Get your tickets here! In 2017, we opened Karam House, Reyhanli for Syrian refugee youth in the community. We've hired a dynamic staff to oversee day-to-day operations as well as a team of skilled mentors to lead innovative workshops to work with students and provide guidance and support to ensure students reach their fullest potential. Meet a few of the women who, despite their circumstances, balancing school, work, and their personal lives, work hard to inspire and restore the confidence and hopes of the hundreds of kids we serve. Eastern Ghouta has been under a government-imposed siege since October 2012. At least 400,000 people remain trapped, with no access to food, water, or medical supplies. Karam announced an Emergency Aid Campaign to support the children of Eastern Ghouta by making and distributing life saving meal packages to malnourished children. At least 700 civilians have been killed since Syrian and Russian forces launched a brutal assault on Eastern Ghouta on February 19. On February 24, the UN Security Council voted on a 30-day ceasefire to allow humanitarian aid agencies to deliver life saving aid. World leaders have failed to enforce the ceasefire as airstrikes continue and the death toll rises. Recent reports indicate that the Syrian regime has used chemical weapons against its own people in Eastern Ghouta. TAKE ACTION: DONATE TO EMERGENCY AID AND SIGN THIS PETITION. use promo code "women2018" at checkout for 20% off of your entire order for the entire month of march! 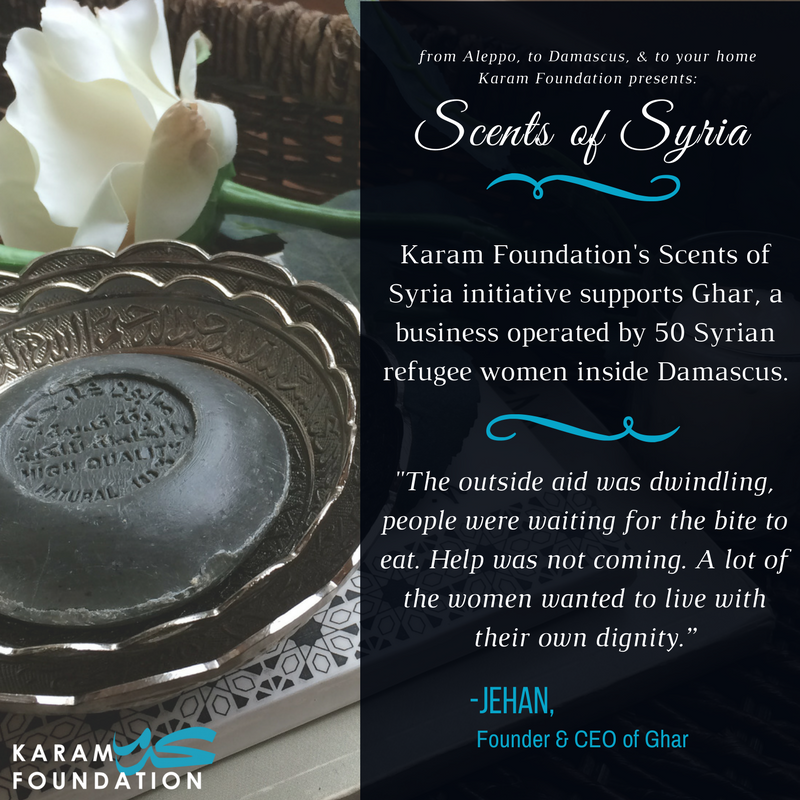 Karam Foundation's Scents of Syria initiative empowers Ghar, a women's collective founded in Damascus that employs 50 internally displaced women in Damascus and 12 refugee women in Istanbul. Shop the product line below! You can read more about Ghar and the founder, Jehan, on our blog! Meet Bana Alabed, the 8-year-old girl best known for her Tweets during the siege of Aleppo in 2016. After their home was struck, Bana and her family fled to Turkey where they now live. Dear World is Bana's first published book that provides readers with a firsthand look at the daily horrors Syrians face from the perspective of a child. On March 4, 2018, Bana made an appearance at the Oscars alongside rapper Common and singer Andra Day as they performed the song Stand Up for Something. She was joined on stage by other activists, including Black Lives Matter co-founder Patrisse Cullors; #MeToo movement founder Tarana Burke; 87-year-old Delores Huerta, who is co-founder of the United Farm Workers of America; and Nicole Hockley, mother of Dylan Hockley, who was killed in the 2012 Sandy Hook Elementary School shooting. You can watch the entire performance here!